The perfect use for leftover turkey and vegetables. This “throw it all in the pot” soup is full of flavor, with just a bit of spice. Growing up my husband’s family owned a bakery in Peru. Located in Lima, they sold more than just bread and pastries, they also sold meals, like Arroz con Pollo, and around the holidays, turkeys. Turkey is traditionally the main protein at a Christmas feast in Peru. My husband raves about his mom’s roasted turkey, but what he speaks about more is the soup that they would have the day after Christmas, using up all the turkey leftovers. 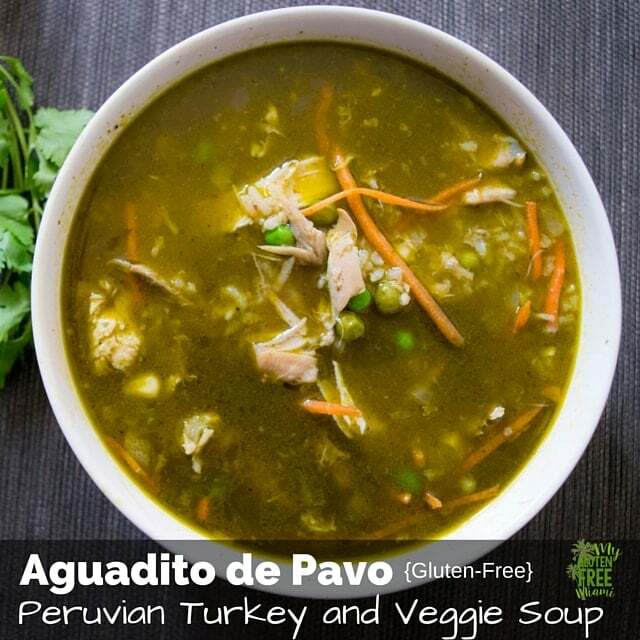 Aguadito de Pavo brings about fond memories in our house. This Thanksgiving we had a lot of leftover turkey, and we knew that this was the perfect soup to make with it and we didn’t have to make any adjustments to make it gluten-free, which is always a plus! The wonderful thing about this soup, is it really is you can use what you have on hand. It is a great use for that wonderful stock you (hopefully) made with the leftover turkey bones. Throw in some torn up turkey, cooked rice, vegetables and cilantro and you have a wonderful hearty meal. A word of warning, if you are not using your own homemade turkey stock, be sure to read the label and make sure the turkey stock you are using is gluten-free. They like to hide gluten in stocks and broths. If you are unsure of what to look for, sign up for our Guide to Gluten at the Grocery Store and you’ll get a super easy to use cheat sheet. It wouldn’t be Peruvian if there wasn’t just a bit of spice! There are two main types of pepper pastes we use a lot of at our house. Aji Panca- Smoky, berry like taste. If you have been reading my blog for awhile, you know that in Peruvian recipes a common spice is Aji Amarillo. A paste made of yellow pepper. For this recipe we also Aji Panca. This is another type of pepper. The great thing about these spices is that you can alter the amount of kick my adjusting how much of each you use. If you like it a little spicy, feel free to add some more. These pastes are available at local grocery store in many areas, but can also easily be ordered from Amazon. They have so many uses, you definitely want to keep them around. Aguadito de Pavo is the ultimate in Peruvian comfort food. 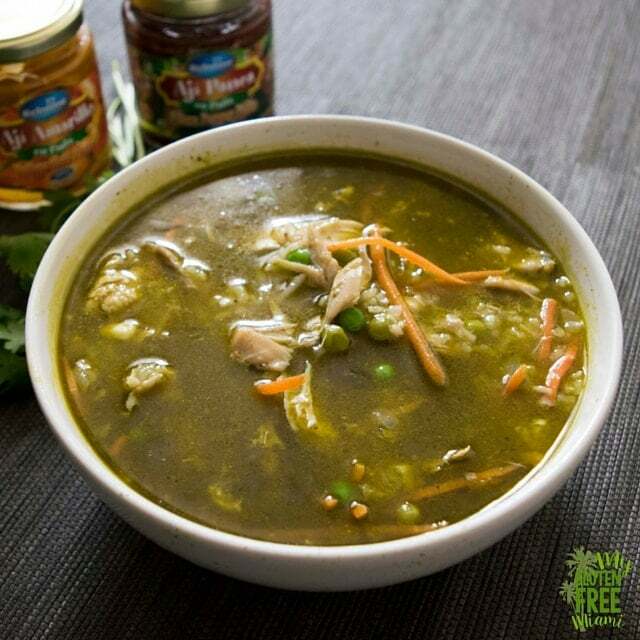 Next time you have turkey, be sure to make some of this amazing soup. You won’t be disappointed. A traditional Peruvian Soup made with leftover turkey, cilantro, vegetables, and rice. Blend one cup turkey broth with one cup cilantro. Set aside. Add olive oil to soup pot and heat over medium heat. Add diced onion, minced garlic, aji amarillo, and aji panca. Saute until fragrant, about 3 minutes. Add the rest of the broth, frozen veggies, turkey, and white rice. Bring to boil. Lower heat and simmer for 20 minutes or until rice pops. What a great way to use up leftover turkey! Will have to try this! I’m ALL about soup right now – and I love everything spicy. This one seems to hit the spot on both. Thanks so much for sharing this fab recipe! This soup looks so hearty and full of flavour! great recipe thanks for sharing! Love one pot dinners, especially made of leftovers!!! I have to admit I’ve never had Peruvian food, so I’m excited to give this a try. Yum! This is perfect for leftover Thanksgiving turkey. This looks so delicious, comforting, and savory. Can’t wait to make this and cozy up to it next week when it’s snowing!! Wow, this looks perfect for leftover turkey! I think I know what I’m making after thanksgiving this year! Very nice recipe and pictures. Looking forward to trying this recipe out- love the cilantro with the turkey combination. This gorgeous soup is exactly what I want to eat for dinner! I can only imagine the savory flavors — will definitely have to give this one a try. Like others, I have not used these spices. But they sound so appealing! Bookmarking this for after the holidays. I’m sick of traditional turkey noodle soup! Thanks! It is delicious and will warm you right up. Love this delicious and healthy soup, love his smart use of leftover! I love cilantro as well, I hope you enjoy! I always check for gluten and carbs in prepared stock as you never what’s added. I love how you kicked up the spices compared to plain turkey soup. Will have to try it out next time we have a bunch of leftovers. Gluten is so tricky! It just doesn’t make sense the things they add it to. We love spices around here and all of our traditional recipes use a lot of them! We spent 2 wonderful months in Peru and really enjoyed the food. Your soup looks divine and can’t wait to make it. Next month we are featuring our own Peruvian recipes, although no soups like this one. Nice job! Peru is such a wonderful country and the food is amazing! I feel very blessed to have married into a Peruvian family that loves to cook. I have several other Peruvian recipes up on the blog and will be adding more. Looking forward to checking out your recipes next month! This looks so cozy 🙂 And Arroz con Pollo was the best meal I had while I was in Peru! Bought it as a little street vendor in Cusco, it was to die for! Thanks! Arroz con Pollo is definitely one of my favorite meals. Cusco is fun as well, we stayed there a few years ago while going to Machu Pichu! This looks so yummy! I just used up my leftover turkey the other night but I am totally going to pin this and come back to it. I LOVE anything with cilantro. We are finally out of turkey as well! I am thinking about trying it out with leftover chicken breast next! This looks fab! What a winter treat. Thanks for sharing the recipe. Will definitely try. Enjoy! Let me know how it comes out! Mmm, the color is amazing on this soup! I can almost smell the spices in here. One pot meals are the best! YEs! I love the addition of cilantro in this! I have never tried the various pimientos….now I am curious!! They are so good and versatile. ..we use them in almost everything we make!